What are the wolves up to? I arrived early in the morning before everyone else. It is always funny to see Mosi peering through the woods towards the gate just so she can see who is arriving. That's one of the reasons she is affectionally known as Nosy Mosi. The weather was cold and wet and forecast to get worse. A quick coffee and surprisingly the sun came out and it turned out quite pleasant. Today was Pumpkin Day. 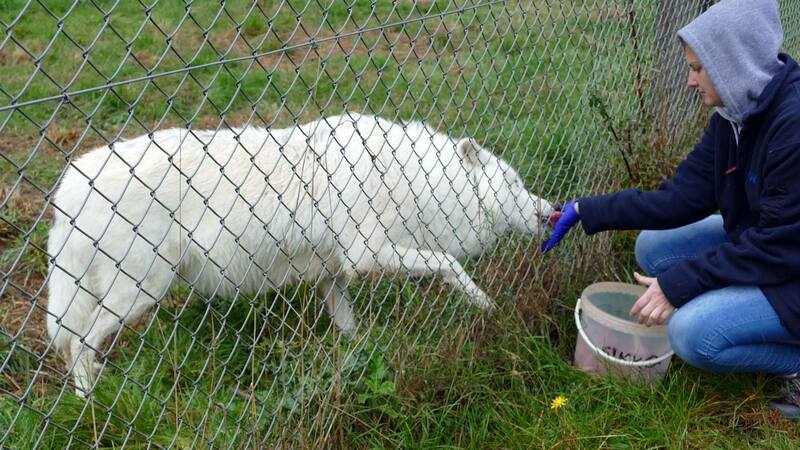 Enrichment is very important for all captive animals and the Trust has a number of ways to keep the wolves' lives interesting. The best enrichment is one that is fun for them and also uses their natural instincts. The pumpkins were hollowed out and pips removed. We then added a few treats in the form of hot dogs and black pudding. 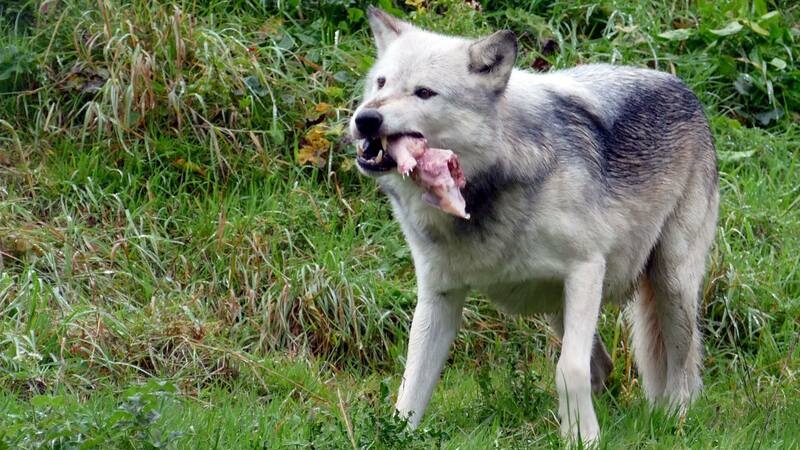 The wolves generally have a raw food diet but the odd exception is made for special occasions. 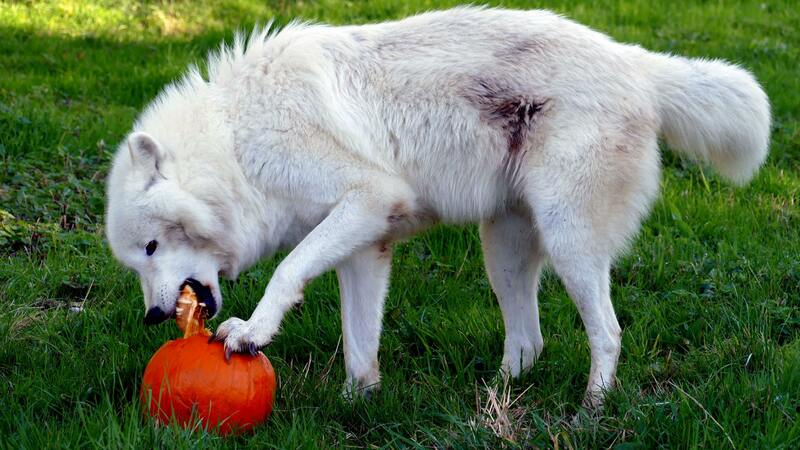 Once all the pumpkins were ready we then took the wolves out for a walk. I opened the gate for the Beenhams to come out and almost got bowled over in the rush. Nuka is generally first out of the gate. When going to the field we have to go past a number of low trees and one of our volunteers' woolly hat got caught on a branch and then fell onto Nuka's head. I missed this as I was behind him but I am told it landed with the Trust logo in exactly the right place. Taking everything in his stride it didn't phase him and he just shook it off. We did a long walk today with Tundra doing all the walk completely amongst the handlers. She doesn't hang at the back as she used to. During the walk a bit of time was spent checking the wolves over for lumps, bumps and anything they shouldn't have. This is part of their regular maintenance and Pat checked over their teeth as well. Walk completed we kept them in the side holding pen for a few minutes whilst we put the pumpkins in their enclosure. We put them on the slope in the hope that they would start to roll and the wolves could chase them like a football. The lids were placed on tightly to keep the treats in. One of the volunteers then accidently let one of the pumpkins roll into the pond and it disappeared into the rushes. 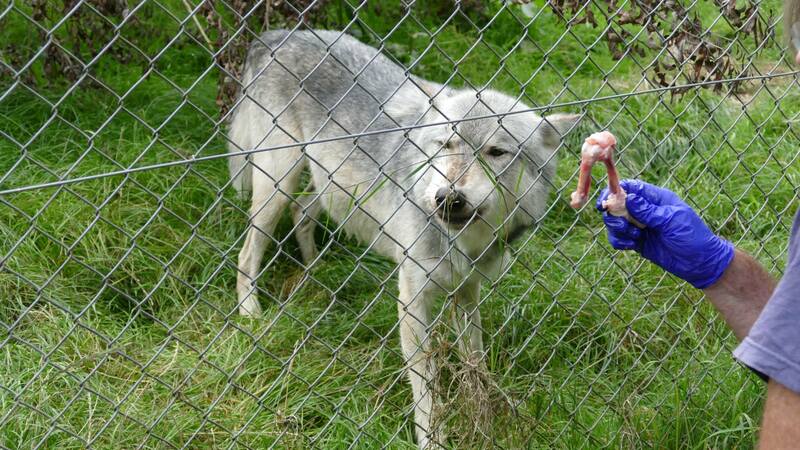 Nuka had been watching this unfold and as soon as he went into the enclosure he was straight in there to get it. As the reeds are tall all we could see was a tail and the reeds moving. We then noticed 2 tails and reeds moving and suddenly there was an explosion of noise from the reeds. 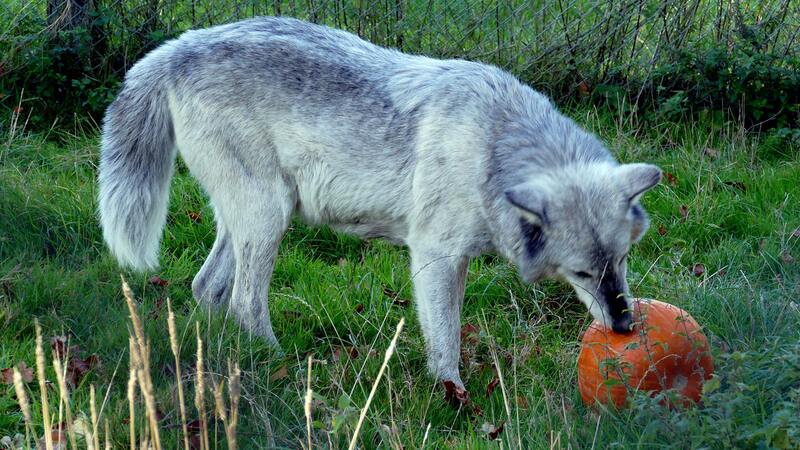 A disagreement had broken out between Tundra and Nuka as to who was getting the pumpkin. Nuka won. We then took Mai for a walk. She sometimes takes a while to decide if she wants to come or not but today she was straight out. 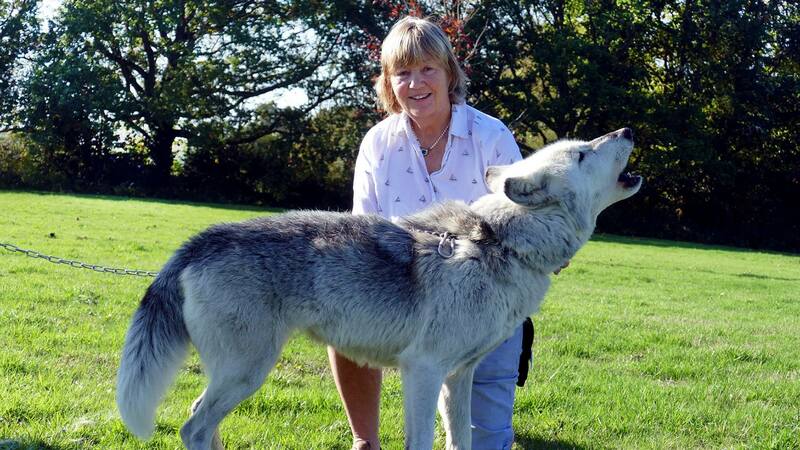 Mai is one of our most affectionate wolves and I had time for a quick cuddle with her before she went out. Fast-paced as always, she did a good long walk. Motomo expressed his displeasure at her going out and howled. When she comes back he always hides and then makes a vain attempt to jump out on her. This never works as she is more interested in showing off to the Arctics that she has been out. 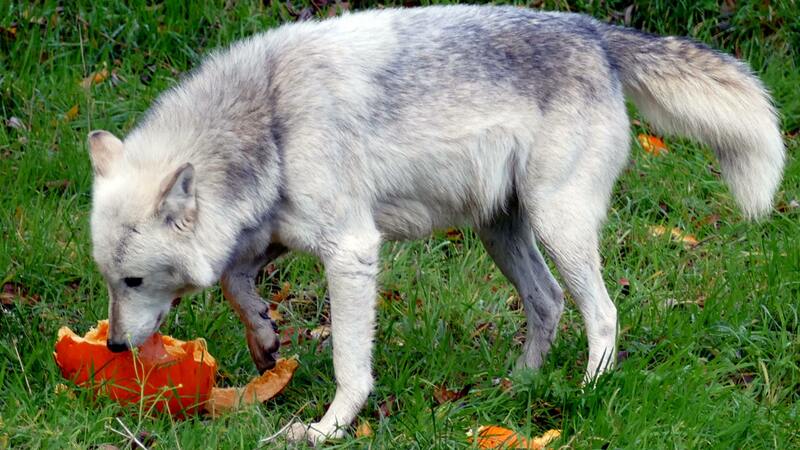 She was given her pumpkin but Motomo held back from coming towards it. Being unsocialised he sometimes takes longer to explore things but takes his lead from her. The Arctics were next for pumpkins. I remember a time when they were wary of them but not anymore. They ran across the enclosure at full speed to get them. Massak was investigating one and Sikko was being particularly funny. She was pawing at him from behind and play bowing in a bid to get him to chase her. This was a game to try and get him off the pumpkin so she could have the treats. He wasn't falling for any of her games and ignored her. As soon as he finished she rushed in and then looked so hard done by as all the best bits had gone. 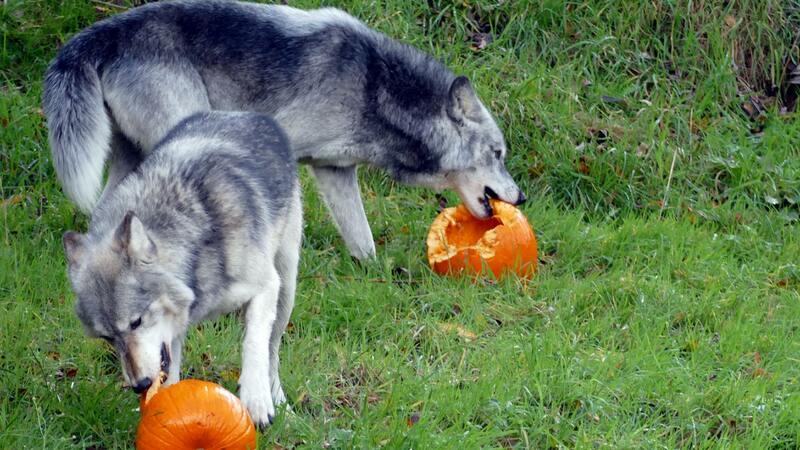 Last but not least Mosi and Torak were given their pumpkins. 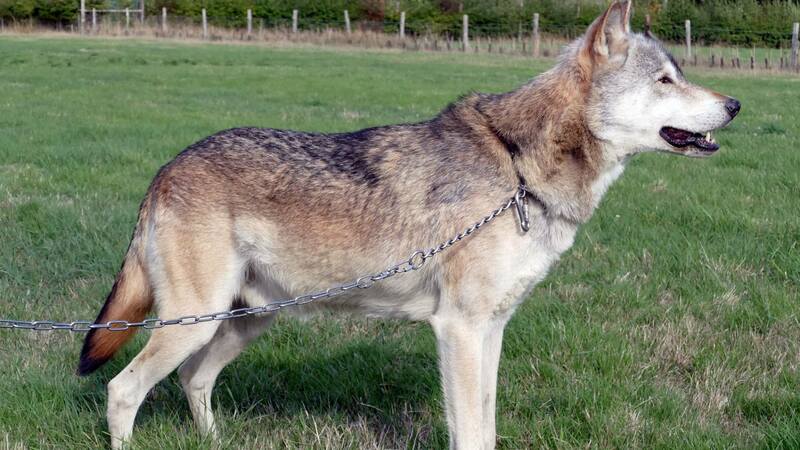 Torak has been around longer then the youngsters and is more experienced. A quick paw to steady it and then straight in with his massive jaw. His whole head disappeared into the centre as he quickly devoured the goodies inside. 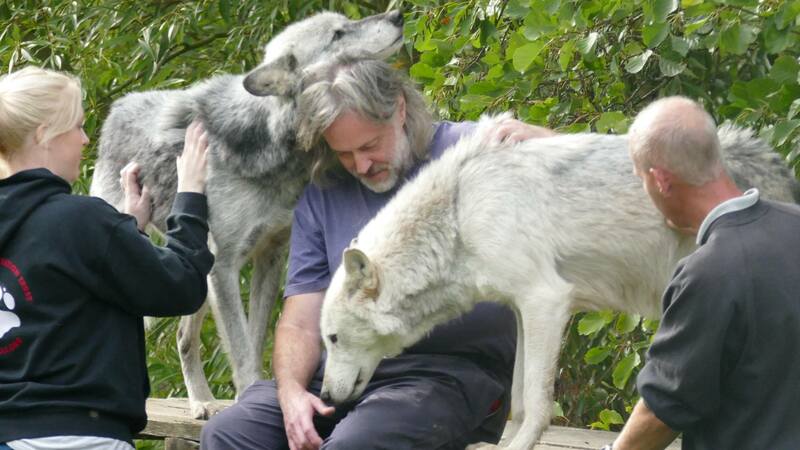 The last thing to do for the day was to spend a bit of quality time with the wolves in their enclosure. There were all as welcoming as ever and came for belly rubs, fuss and just to spend some time with us. Click or tap on a thumbnail for a larger version. 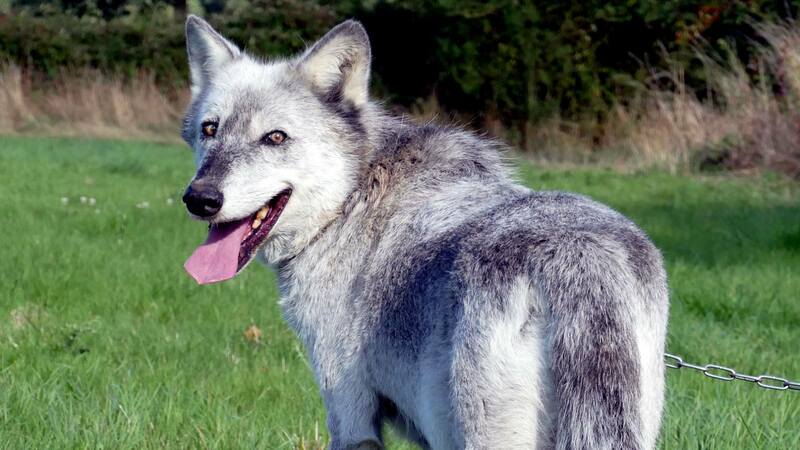 Finally we had fantastic weather today for our wolf walks. 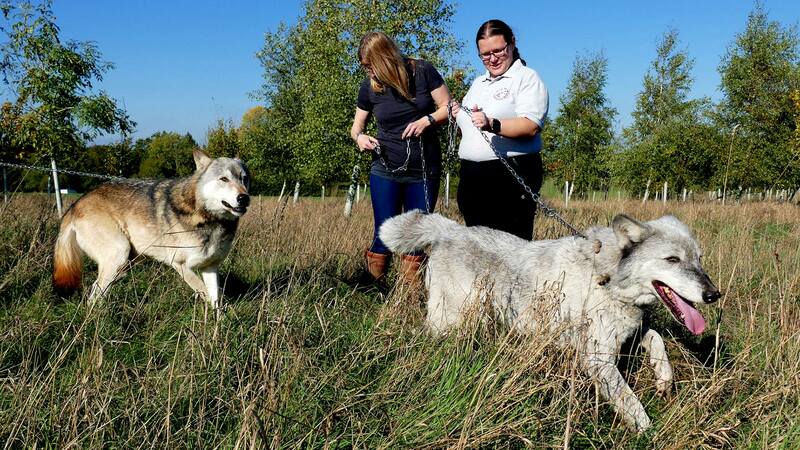 All the handlers started out with coats and fleeces which got rapidly shed during the first walk with Nuka, Tala and Tundra. They were keen to get out and about, thoroughly enjoying the morning walk. When we did public walks, they were always out at 12:30 so getting out at 10:30 is a new experience for them. 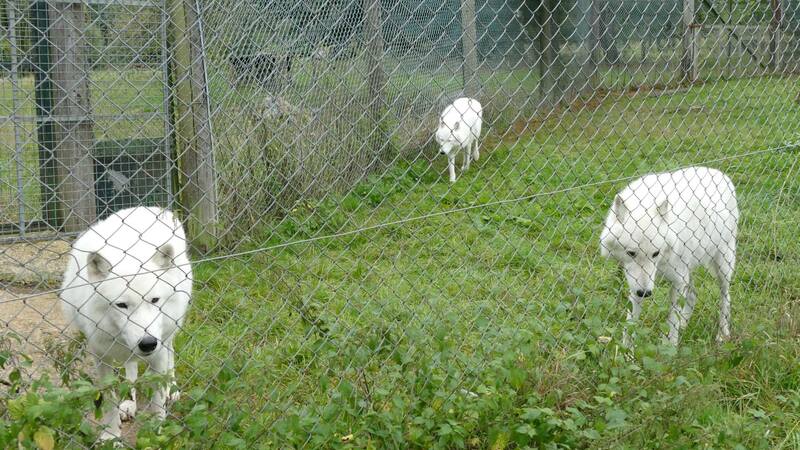 All 3 wolves look fabulous in their winter coats which seem to have just appeared over the last couple of weeks. 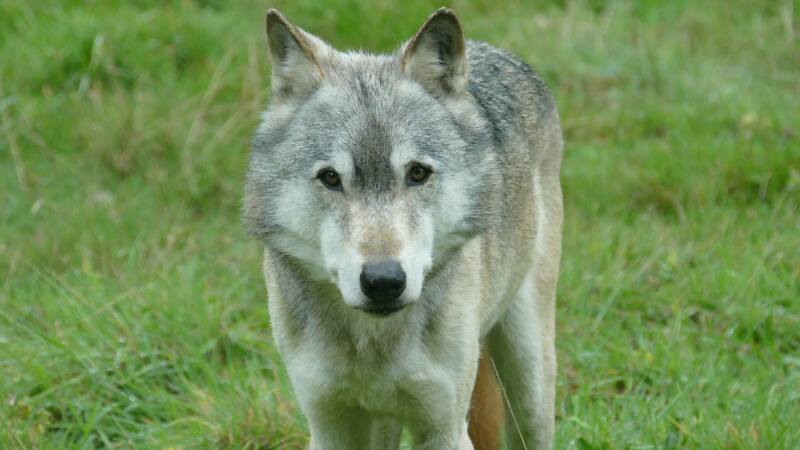 Mosi and Torak were next out and even though they are also 12½ they don’t behave their age! They both keep their handlers at a fast pace and trying to get photos of them is very difficult as they don’t stand still. Mosi had to over scent where Mai, her sister, had been as soon as we were out. They are not the best of friends since Mosi and Torak decided they were going to be together and Mai was moved out of their enclosure, many years ago now. 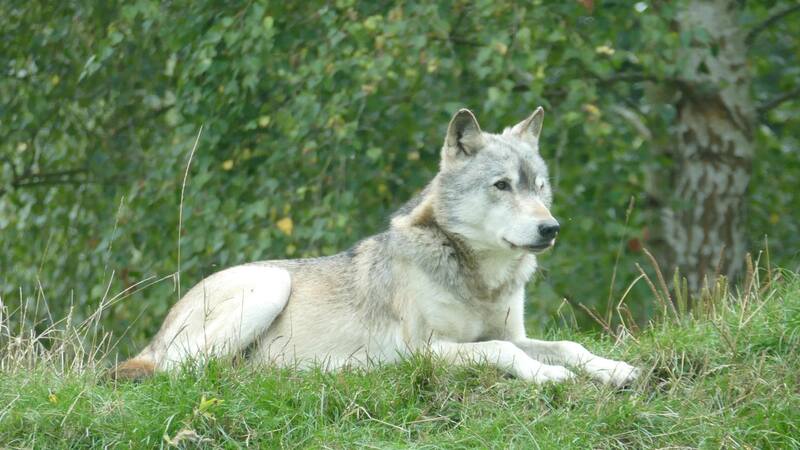 However, she ended up with the very handsome Motomo and produced our wonderful Beenham pack. After 3 walks we all had a rest along with tea and biscuits. Then it was back into the food shed for more freezer moving and sorting out the wolves' food. All the wolves ate well today and had lovely fat bellies after. We ended our day by spending some time in the enclosure with the Beenhams. Nuka acted like a naughty teenager and then ran off to be on his own. 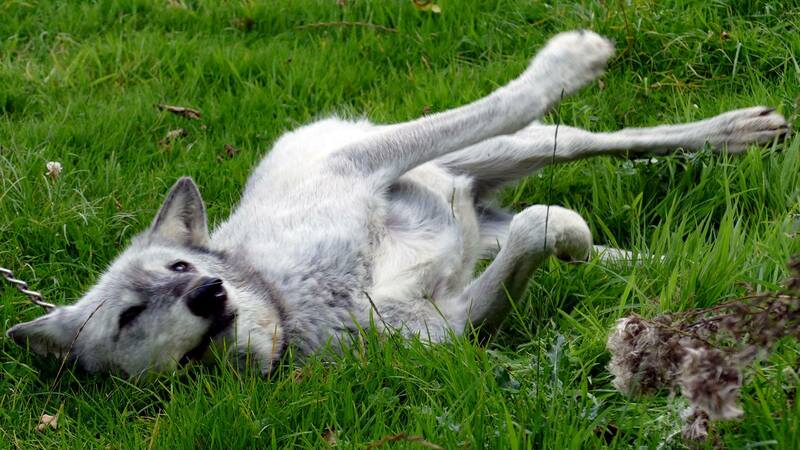 Tala and Tundra stayed with us, giving everyone head rubs in exchange for us giving them a lot of fusses and massages. We all agreed, once again, it had been a great day in the presence of these wonderful wolves. We all had some problems getting to the trust today due to flooded roads and torrential rain! We braved the elements and first out for their enrichment walk was our Arctics, Massak, Pukak and Sikko. We all noticed that they are already in their winter coats. They also enjoyed having a good old shake on the walk to get the rain off their fur, soaking us even more. They were happy to be out and enjoyed sniffing around and thankfully no rolling around in muddy puddles! This is amusing to watch but no fun for the handlers who have to uncollar them at the end of the walk. After the Arctics were back in their enclosure, we retreated inside for biscuits and hot drinks after watching them interact with Motomo and Mai who were waiting for them by the fence between their enclosures. While we were drying out we prepared the wolves food for the day, which was chicken and some very good looking beef! 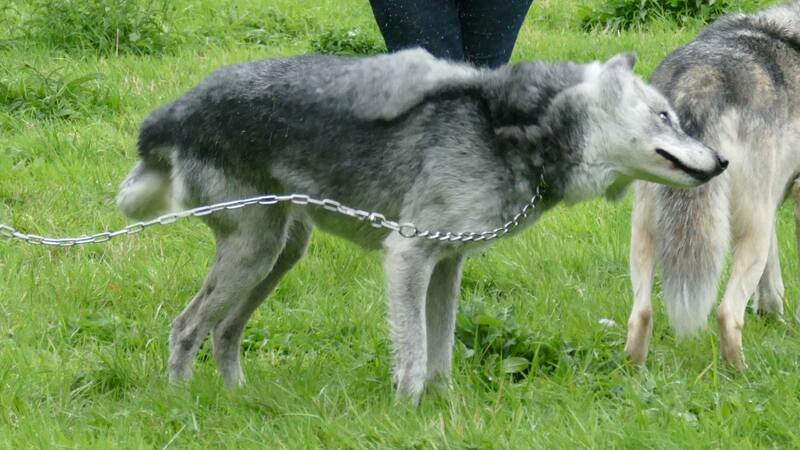 Thankfully, the rain had eased as we took the Beenhams, Nuka, Tundra and Tala out for their walk. As usual they were keen to get going and gave us some exercise. Nuka got into a nice trot, so short legged handlers had to widen their step to keep up with him. We can slow the wolves down on walks by walking slowly ourselves, but it is nice to let them go at their own pace too. 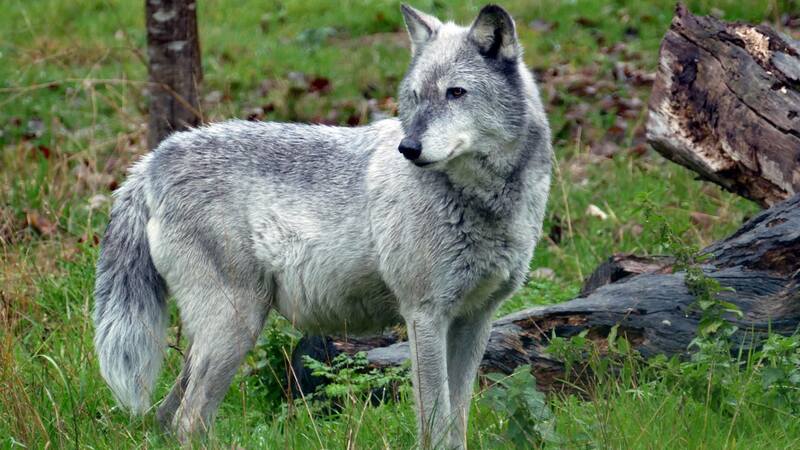 It’s great to watch a wolf trotting as only the legs seem to move; the back and head appear stationary. Today the weather was very wet with continuous rain becoming heavier as the day went on. We didn’t have enough Senior Handlers to take the wolves out for walks today but this is not a problem as the wolves do not need to be exercised. They play a lot of chase games with each other in their enclosures, so the walks are more for enrichment purposes. 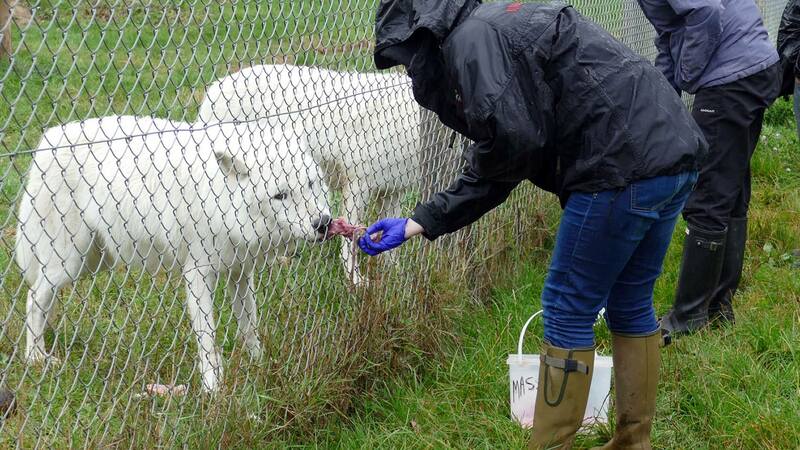 All the wolves came down to us for a big fuss and we spent a long time giving them scratches and fusses through the fence. When one side is done, the wolves turn around so we can do the other side for them! Massak, our alpha Arctic male was in a very playful mood and when his siblings wouldn’t join in, he tried to get us to play with him, from where we were outside. It is very good to see all the wolves so happy and the Arctics have settled into their new environment very well. Feeding today was also a wet affair. All the wolves ate well having a mixture of chicken carcasses and prime beef! 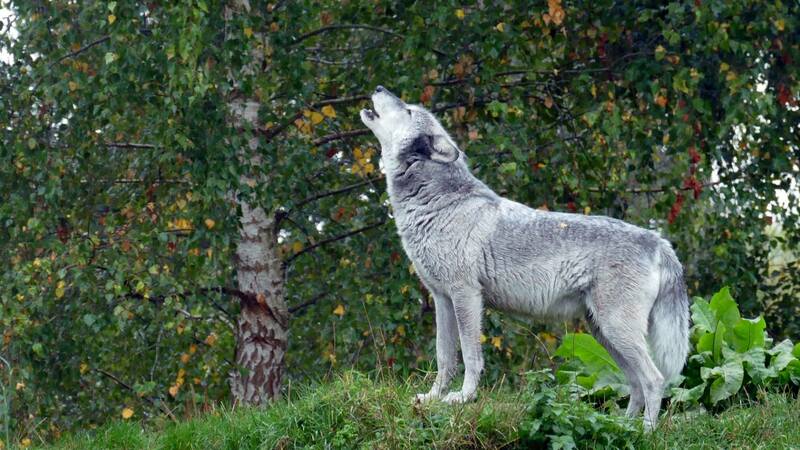 Mosi was her usually curious self and had a howling session after eating. We spent a couple of hours in the food shed cleaning out some more freezers. A very messy job! 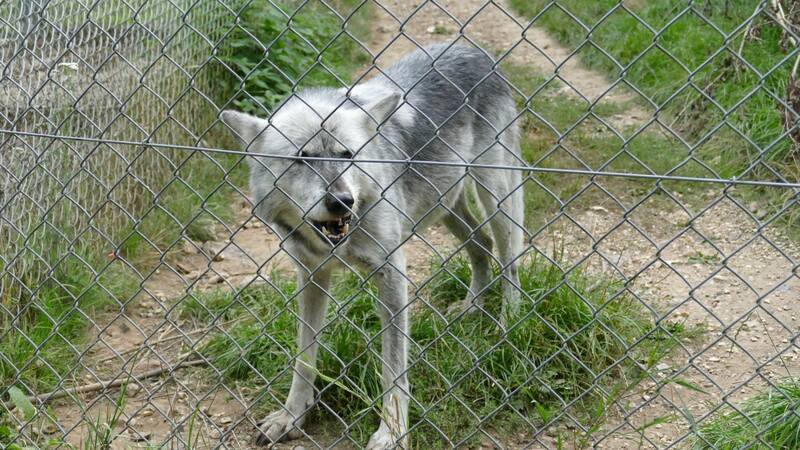 They are now back to showroom condition and will be used to accommodate some new supplies for our wolves. Despite the weather we all enjoyed our day. 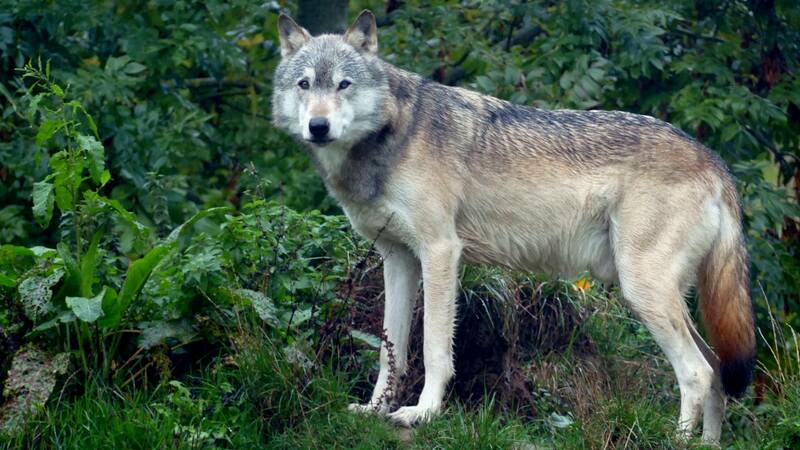 Just being around the wolves, even in the rain is a privilege. The weather was good for us and the wolves today. 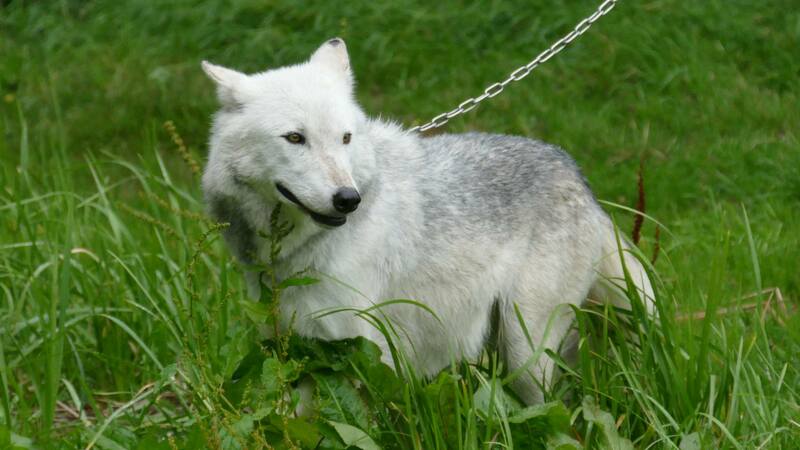 First out for their walks were Massak Pukak and Sikko, our Arctic wolves. Sometimes they play the handlers up by not coming onto the hard standing and running around their enclosure. They get excited! However, they were keen to come out of the smaller holding are they had been in while Mai and Motomo’s old enclosure was cleaned up and the grass cut. Grass cutting in the enclosures is done by Tsa on a tractor, so quite entertaining to watch! Once the Arctics were out handlers were allotted to each of them and off we went around the fields. They were all interested in the smells and enjoyed rolling around in some particularly smelly deposits left by other animals previously. 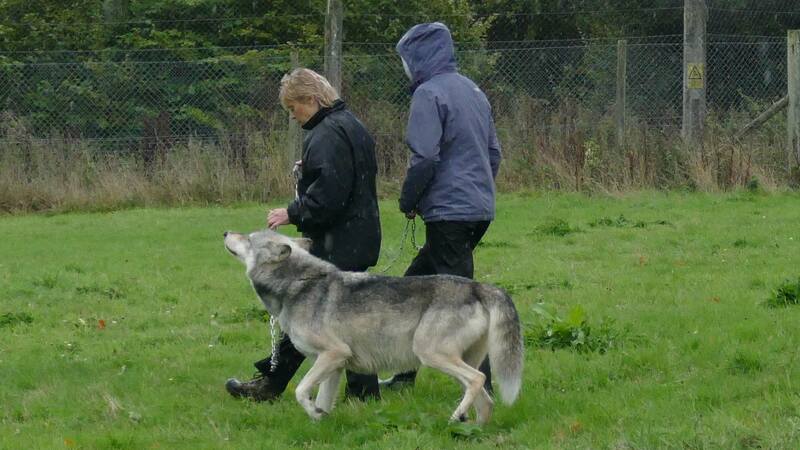 Our seniors are in charge of all of the handlers and the wolves change handlers during the walk to get the wolves used to more people walking them. Sikko, the female likes to wind up her brothers by stalking up to them and interfering with them. Once she has them growling, she walks away as if butter wouldn’t melt in her mouth. We walked them back to their new enclosure and without any hesitation, they all ran in and started to investigate. 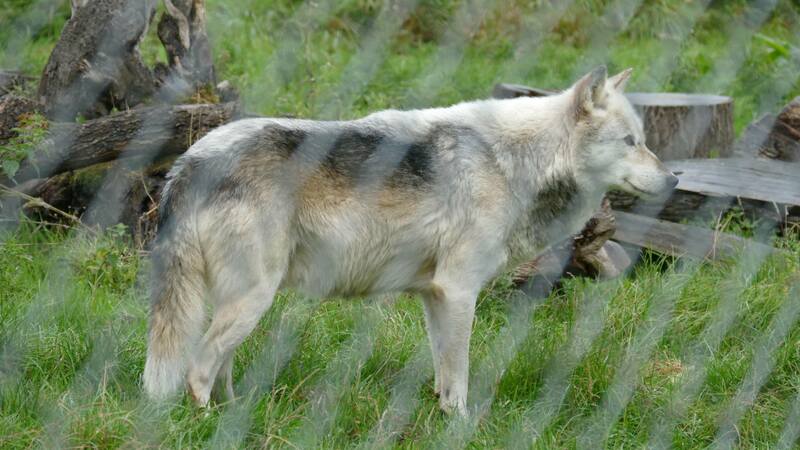 Motomo started to play run up and down the fence in their old enclosure where he and Mai now are and all wolves seemed pleased to be in different enclosures. The Beenhams also got excited at having new neighbours and were bouncing around. Mai did not want to come out for a walk, most probably due to only just getting into a different enclosure and preferring to stay with Motomo. The Beenhams were keen to come out on their walk and gave their handlers a boot camp walk! 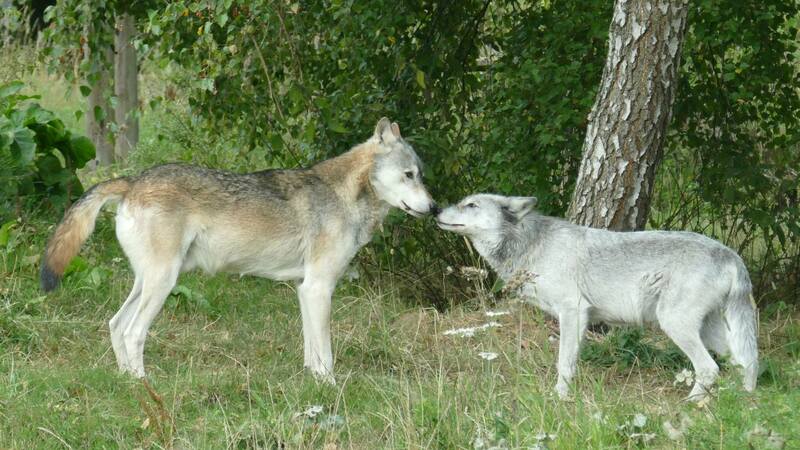 They know the route and like to over scent any other wolf smells they come across. They made sure they came and said hallo to all the volunteers who weren’t handling. 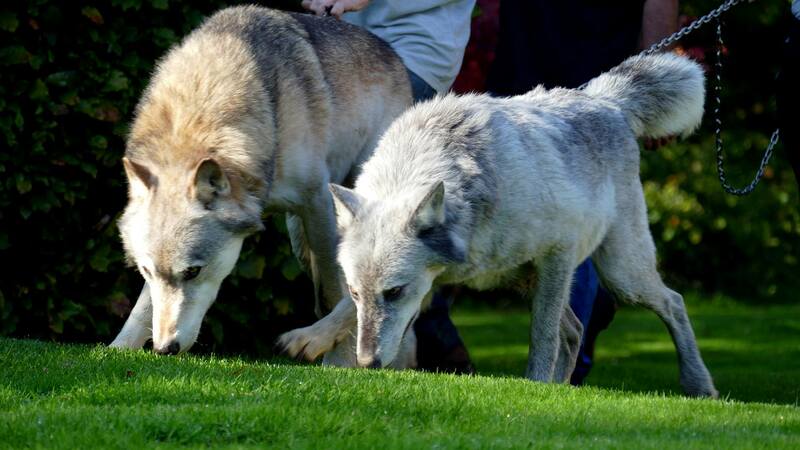 Torak and Mosi also came out for a walk and after seeing all the other wolves going out, were very keen to get in on the action. Despite being 12 years old, they still walk at a fast pace! 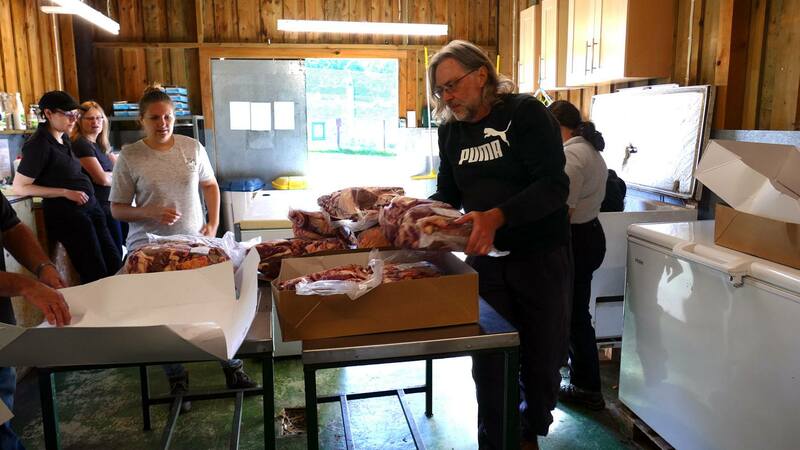 After all the walks, we fed the wolves and then helped in the food shed to clear out old freezers and prepare for some new supplies of food for the wolves. Rain or shine, life goes on at the Trust. The 22nd saw plenty of rain, but it didn't bother the wolves - it never does! Over a dozen volunteers had put their names down and each was greeted by Mosi. Although she no longer sees the public, she continues to check out the volunteers as they arrive. Torak as usual kept a keen eye on arrivals, too, as he's always keen to come out for a walk with his handlers. There have been some changes to the enclosures, as Mai and Motomo have moved into the Arctics' old enclosure for the winter. We feel Mai will benefit more from the kennels there. The Arctics are temporarily in the holding pen next to Torak and Mosi while work takes place to prepare Mai and Motomo's old enclosure for them. The Beenhams, as ever, are resident in the lower enclosure. 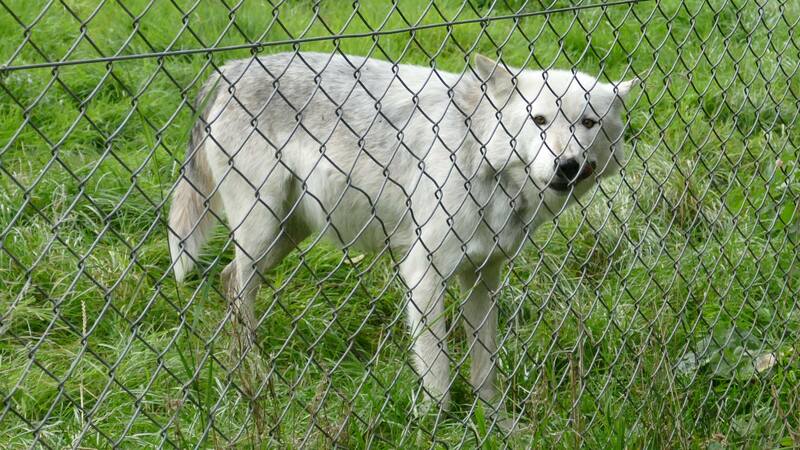 Work such as grass cutting in the enclosures continues, with the aim of keeping the wolves comfortable and safe. There were enrichment walks for the Beenhams, as well as Torak and Mosi; Mai wasn't interested in coming out, instead preferring to stay with Motomo. Torak, Mosi and the Beenhams, however, enjoyed their walks, with Torak and Mosi both delighting in rolling in smelly stuff! Nuka, meanwhile, was fascinated by the green covering on the hay bales in the lower field, although much as he wanted to he didn't get to take any back with him. As the Arctics have now moved, the webcam covering their enclosure now shows Mai and Motomo. 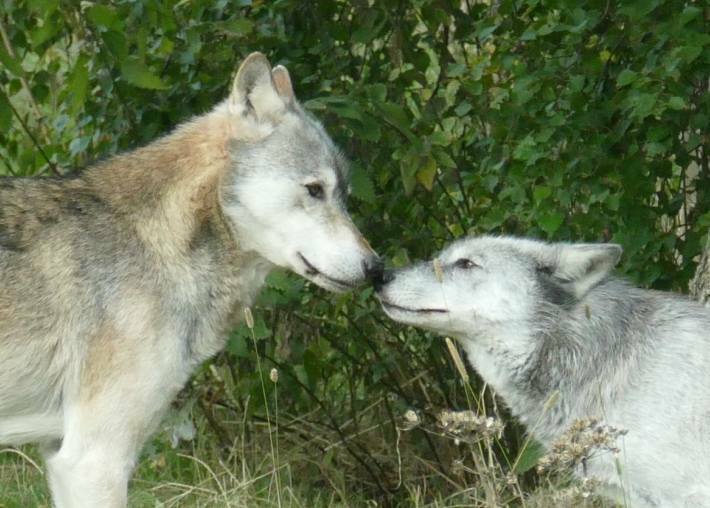 Now that the Trust has closed to the public, the wolves are settling in to their retirement. Enrichment walks still take place at weekends and there's always plenty to be done on site! The Arctic wolves' enclosure was tidied over the weekend and there was maintenance of the paving slabs we've installed to keep the Arctics' claws in check. The Arctics themselves, in their holding pen, were fascinated by the weeding, hosing and hoeing. Mosi and Torak, as usual, had seen there were enough handlers to take them for a walk. They were very keen to come out and enjoyed a brisk walk around the back field, down to the stream and back. 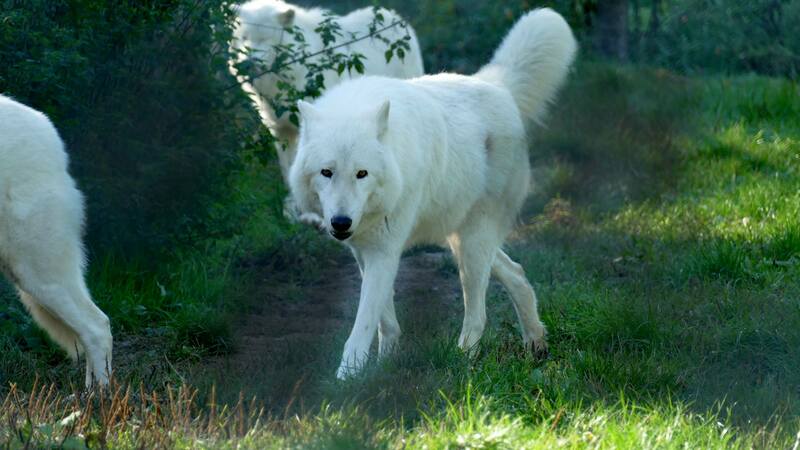 Walks with Torak and Mosi are usually quick affairs, as despite their advancing years both wolves walk at a fair old pace. The Beenhams also came out for an enrichment walk, following the route they know so well. 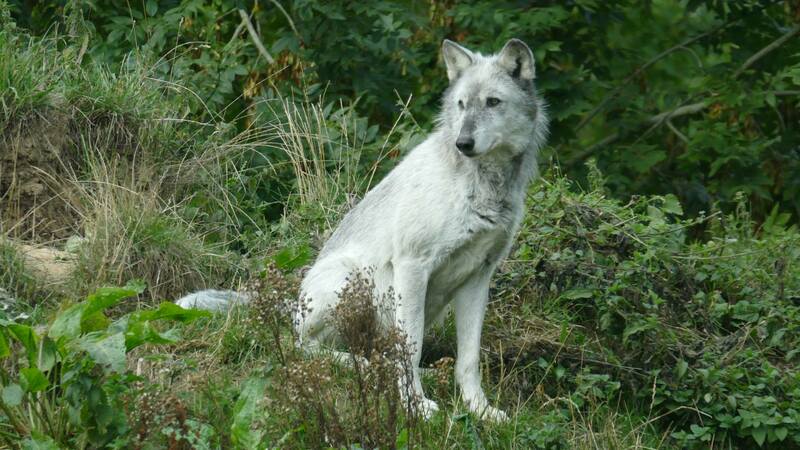 Tundra kept looking over her shoulder, seemingly looking out for the crowds which usually accompany the pack. 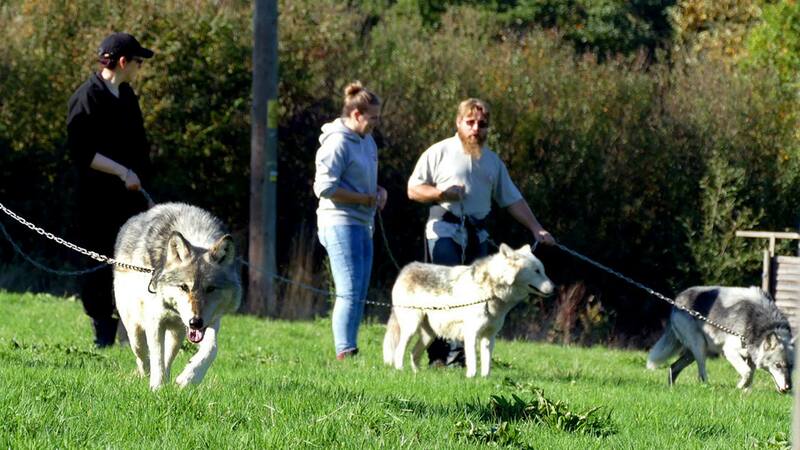 Seeing that it was just the volunteers and the wolves, she frequently took the lead and set a quick pace. 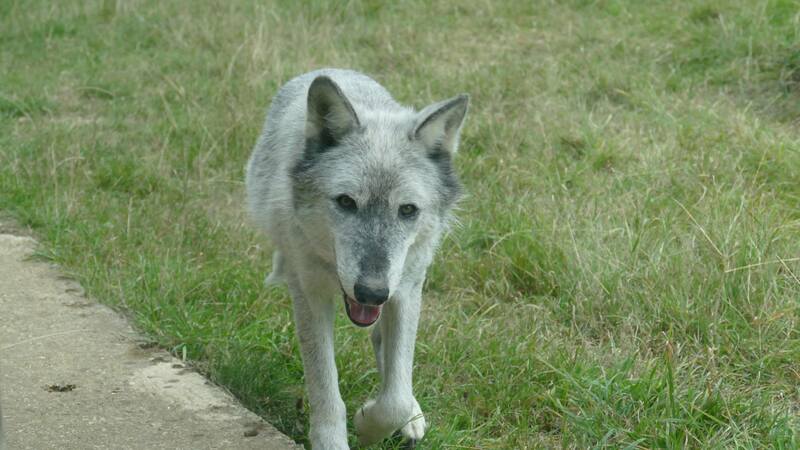 Tala wasn't able to get up to any mischief (such as howling, or scent marking with her paws) this time! Motomo and Mai, meanwhile, were relaxing in their enclosure. 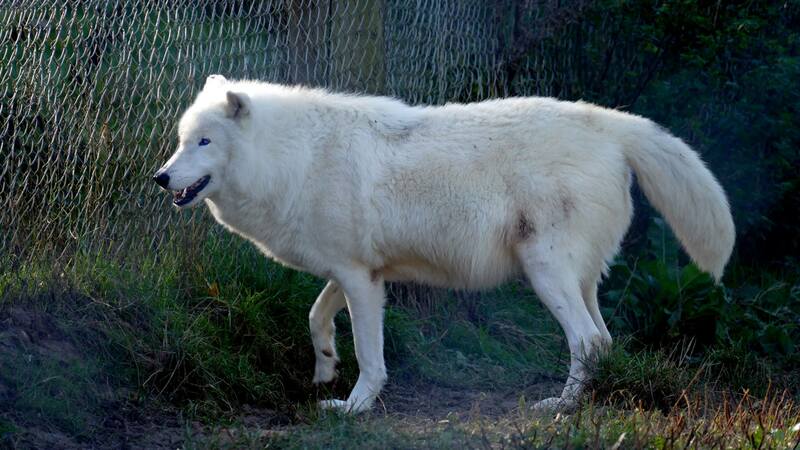 Mai remains an elegant wolf and Motomo was never far away from her. Feeding carried on much as usual, albeit with different timings to before. 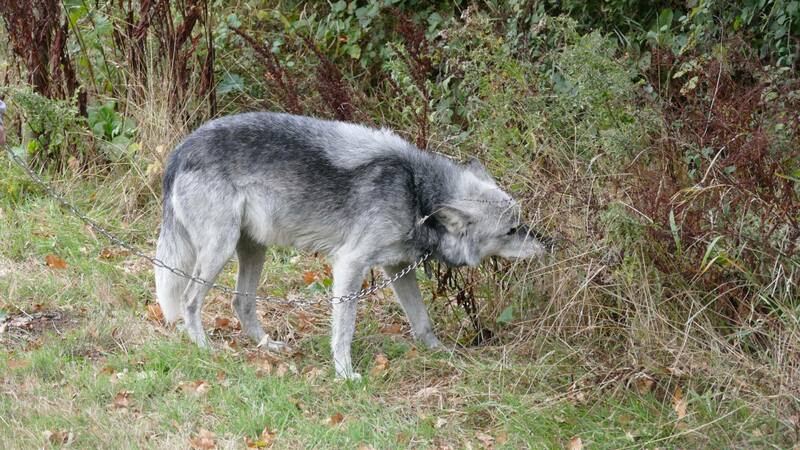 The wolves are still fed a mixture of chicken and beef at weekends and all seemed to enjoy their meals. As is usual after a walk, the handlers entered the Beenhams' enclosure for some socialisation. 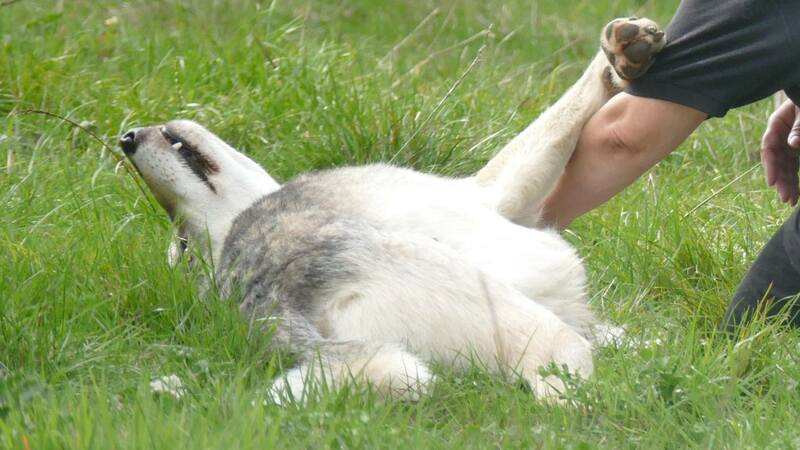 This is one of the things which helps maintain the relationship between handlers and wolves and is something which is enjoyed by wolf and handler alike.